Winter Landscaping - A Winter Wonderland! Home » Decor & Design » Outdoor Living » Winter Landscaping – A Winter Wonderland. With winter fast approaching, I wanted to address some options for landscaping. Although, it is not a time of the year when people think about their landscape, there are plenty of things that can be done to add some pizazz to your exterior. When done correctly, winter landscaping can create a winter wonderland! The good news is that much of the winter months can be covered simply by decorating for the holidays. 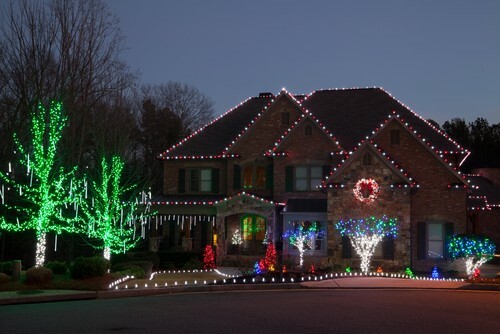 Christmas lights usually go up right around Thanksgiving and stay until the New Year. This can be a fun and festive way to add some color to a sleeping landscape. But, if you are one of those who doesn’t have the time or the energy to go all out with lights, a few simple entranceway decorations can go far. 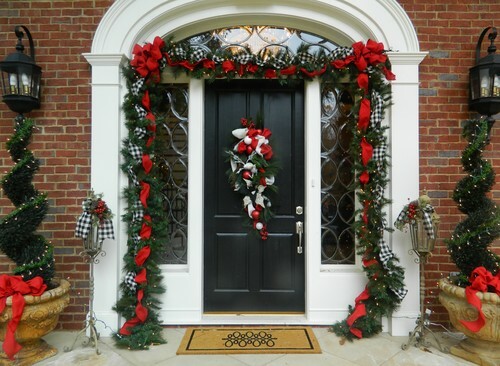 Add a nice colorful wreath to the door and trim with some garland. A great way to have a nice landscape during the winter is to landscape during the spring with plants that will provide texture and interest during those drab winter months. Evergreen shrubs are a nice way to keep a lush looking lawn all year long. 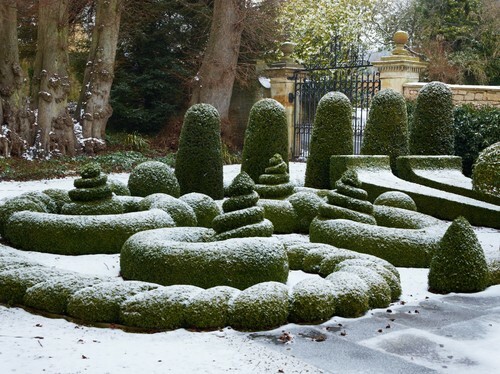 Think about some ways that shrubs can be arranged so that they will create a unique feature during the winter months. The winter months do not have to be without natural color, with a little bit of planning. 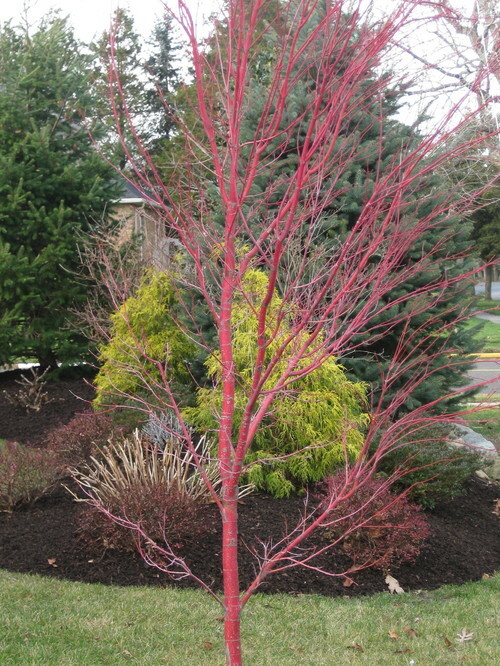 This coral bark maple tree provides color all year long. Against a snowy backdrop, these really make a statement. 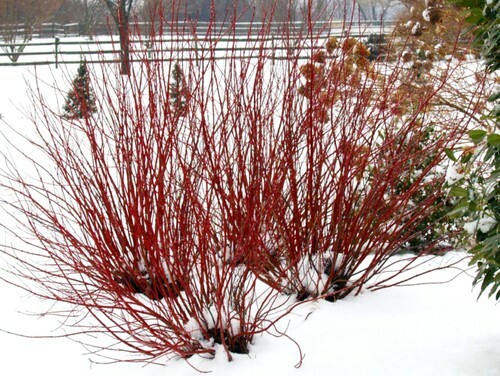 These red twig dogwood shrubs are another way to add a splash of vibrant color to your winter landscaping. Throw several of these together in a grouping to create the most impact. Nice winter interest can also come from texture. This micantus (ornamental grass) is just as beautiful after it goes dormant as it is during the summer months. 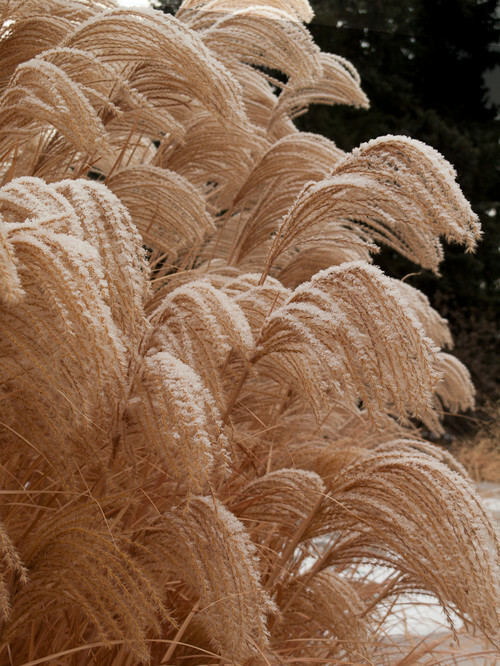 I like to leave all of my ornamental grass until just before the end of the cold weather. Then, I reluctantly cut it back to allow the new growth to come in. Luckily, it will quickly return to all it’s glory within just a few months. 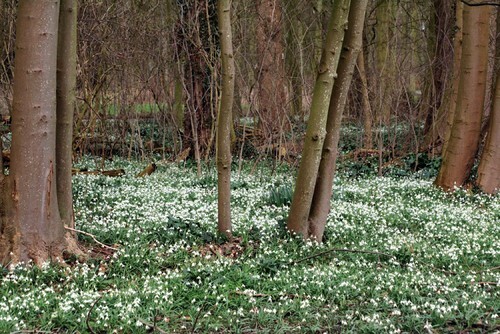 Snowdrop is a great way to get an early bloom going for the new year. These little gems love the cool weather. They pop their little heads up, sometimes even before the snow is gone. They work great as an underplanting or as a border. They do not like the hot summer months though, which is when they are dormant. So, these won’t do well in hotter areas – such as Florida and parts of California. I have grown them with great success though here in Tennessee. 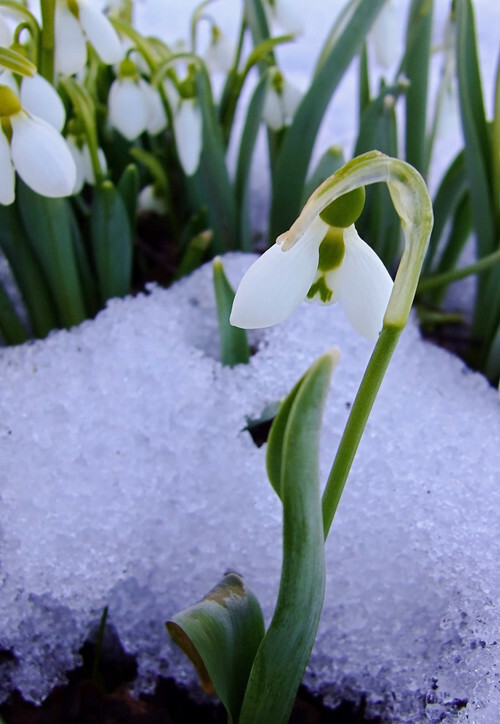 This is the perfect time of the year to put these bulbs in, but don’t hold onto these bulbs for long. They should not be allowed to dry out. Plant them in an area that will be shaded from the hot sun, such as beneath the edge of shrubs or on the north side of a structure. (Remember where you place them, so that you don’t disturbed them during warm weather landscaping. You won’t be able to see where they are after winter has passed and they go dormant). If you don’t have the space to add landscaping, or your like me, and don’t want to anything during the winter except snuggle in a comfy throw, then containers may be the way to go. 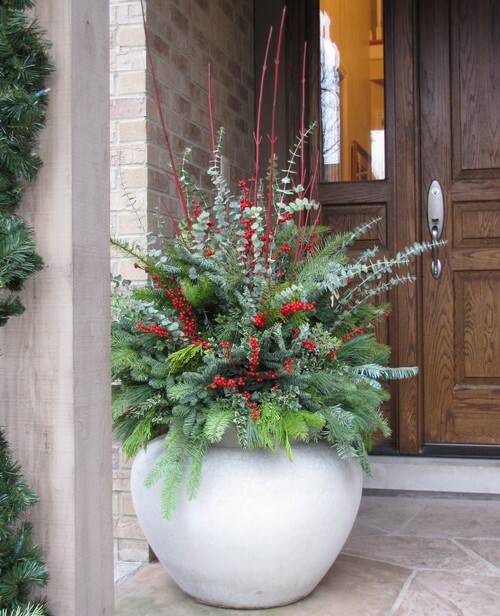 Create a winter arrangement by combining some of the seasons best evergreens – like cedar, fir, or junipers. Combine a few red twig dogwood branches and some holly branches with the berries still attached. 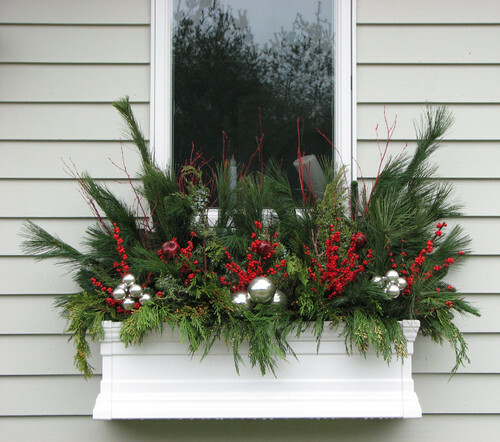 Don’t let those window boxes sit empty during the winter months. Add a nice arrangement to them as well. To make an arrangement work for the holidays, add a few decorations. Once the holidays pass, an arrangement can hold its own. Tip – Remember that outside arrangements need water just like an inside cut arrange does. I like to use a wet foam florist cube. They look like those green styrofoam blocks, but they are used for cut flowers instead of silk flowers. Soak it in water, and then use the same way as the styrofoam blocks. If you need some easy and fast ideas for adding some winter interest, why not put those cold temperatures to work for you. 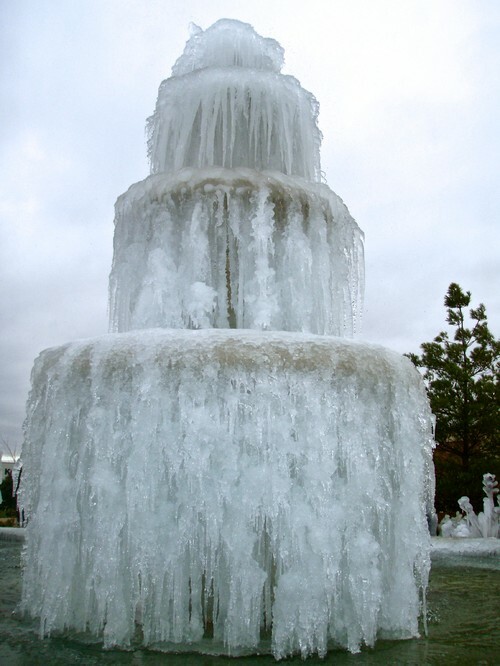 Take a look at some of these beautiful ice sculptures made with little to no effort. Create your own ice ornamentations. 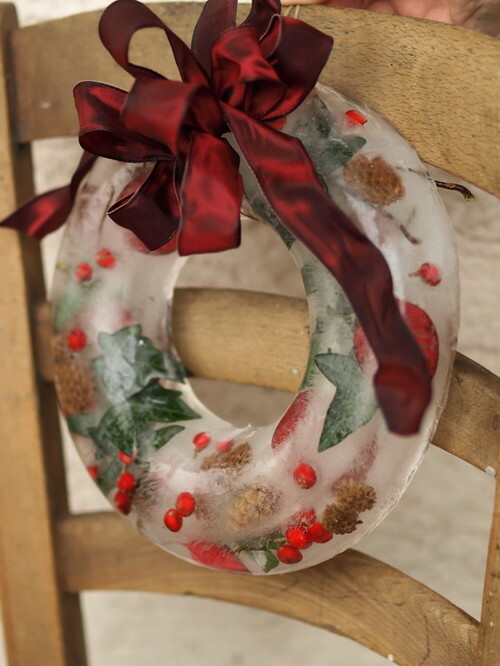 I love the ice wreath, which I will be posting a how-to for very soon. I just wish it was cold enough here during the holidays for it to stay frozen.